Robert C. Jones served as President of the Kennesaw Historical Society for 21 years (1994-2015), and also served as a member of the executive board of the Kennesaw Museum Foundation for 17 years (1998-2015). The Foundation helped fund the 45,000 square foot Southern Museum of Civil War and Locomotive History in Kennesaw, GA.
Robert has written 45+ books on various historical topics, including the Civil War, Revolutionary War, World War I & II, the War of 1812 and ghost towns. They can all be accessed from this Web site. Robert is also available as a guest speaker in Georgia, Alabama, Eastern Kansas, Western Missouri, SE Pennsylvania, New Jersey, South Carolina and Tennessee. I'm willing to speak in other states as long as travel, lodging and food expenses are provided. 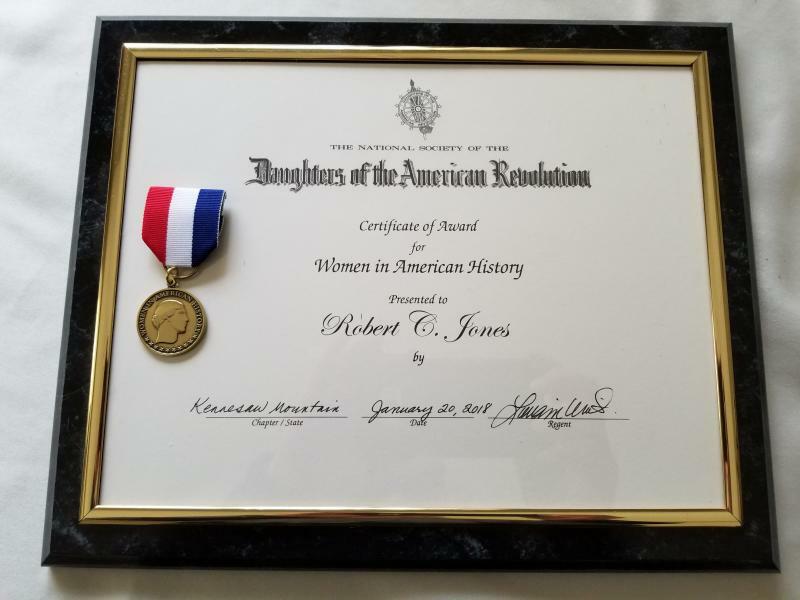 On January 20, 2018, I received an award from the National Society of the Daughters of the American Revolution for "Women in American History"
Daughters of the American Revolution Award for "Women in American History"